Dimensions: Graduated flat rectangles. Center bead 22mm top to bottom, 18mm hole to hole. The two smallest (at each end) are 20mm x 16mm. Spacers are 10mm x 5mm. Description: I must say I love this set and almost want to keep it to create my own finished piece. 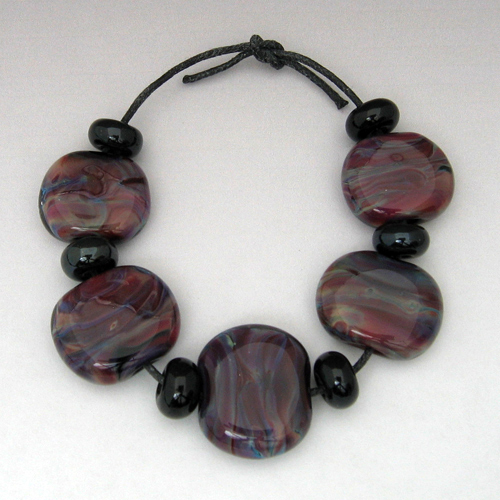 The five rounded rectangular beads have a black base that was then wrapped with one of my favorite silver glasses. Wonderful patterns with color ranging from red to blue to tan to purple. Encased with super clear glass. The set includes six black spacers.